Who’s ready for summer picnics and parties? Do you have a standby picnic side dish you take any time you are asked to bring a dish to share? Whether you are still looking for that special recipe or just want to change things up a bit, we have a few recipes and ideas that we think are great additions to the spread of summer picnic side dishes at your next summer get together. Our summertime BBQ motto? Keep it fresh and mostly simple. Summertime is all about stopping to smell the roses and soaking up the sun, enjoying the laughter of kids and catching up with friends. We don’t need extra stress to get there. Pesto Pasta Salad – I love using my Nut-free Hempseed Kale Pesto, thinning it with a little extra oil, and tossing it with parmesan and pasta. Definitely a favorite picnic salad. Watermelon Feta Salad – give that traditional watermelon slice a change up. Add a little feta, cilantro or parsley, and a splash of balsamic dressing for a light, refreshing, and hydrating salad. 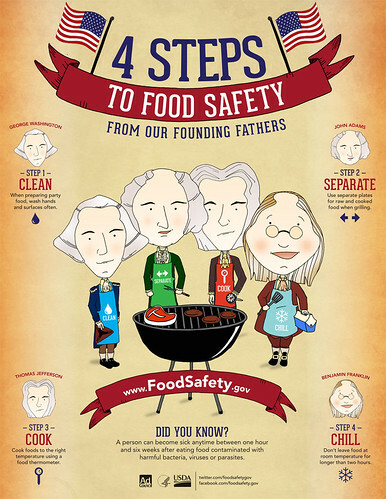 No matter what you take make sure to practice food safety. You don’t want to remember this summer for a bout of food poisoning. Visit FoodSafety.gov to learn about best food safety practices, utilize “Ask Karen,” an online database with nearly 1,500 answers to specific questions related to preventing foodborne illnesses, in both English and Spanish, or to call the USDA Meat & Poultry Hotline at 1-888-MPHotline. What summer picnic side dish are you bringing to your next gathering? Stay tuned because next week we are back with our favorite summer picnic beverages. Very nice collection, thanks for sharing with Hearth and Soul blog hop. Another great grouping of tips! Thanks for linking up at the Merry Monday’s Linky Party this week. Have an awesome weekend! I saw a super idea the other day. Fill a kiddie pool with ice and set your cold foods in there. I bet you could just use a plastic bucket or shallow Rubbermaid box, or if you really want to, a cheap inflatable baby pool and bring a bag of ice! Thanks for linking up at the Simply Sundays link party! Oh, that’s a great tip!